Until the introduction of modern machinery, animals have played an often-decisive role in warfare. For instance, the Mongol’s masterful use of horses allowed Genghis Khan and his generals to carve out the largest land empire ever known. In the book Beasts of War: The Militarization of Animals, author Jared Eglan curated amazing insights into how militaries have used a stunning menagerie of animals in combat. From a 440-pound bear to pigeon-guided missiles, here are nine notable examples of wartime animals. Elephants, with their massive stature and fearsome tusks have been employed in warfare since ancient times. Elephantry units were first incorporated in militaries in India, but throughout time, famous generals including Pyrrhus of Epirus, Hannibal, and Alexander the Great all used elephants to literally crush their opponents. War elephants were usually deployed in the center of the line, where the imposing beasts would charge at up to 20 mph towards the enemy. They were also used to carry heavy materials across difficult terrain before tanks and helicopters were an option. Unlike horse-mounted cavalry, elephants didn't fear infantry lines bearing spears, their muscular and articulate trunks could navigate a wall of spears much better than a charging horse. The mere sight of elephants charging was enough to break lines and cause many armies to flee in terror. Only cannon fire made the war elephants impractical. The giant animals were resilient against musket fire, but provided a huge target for cannons. 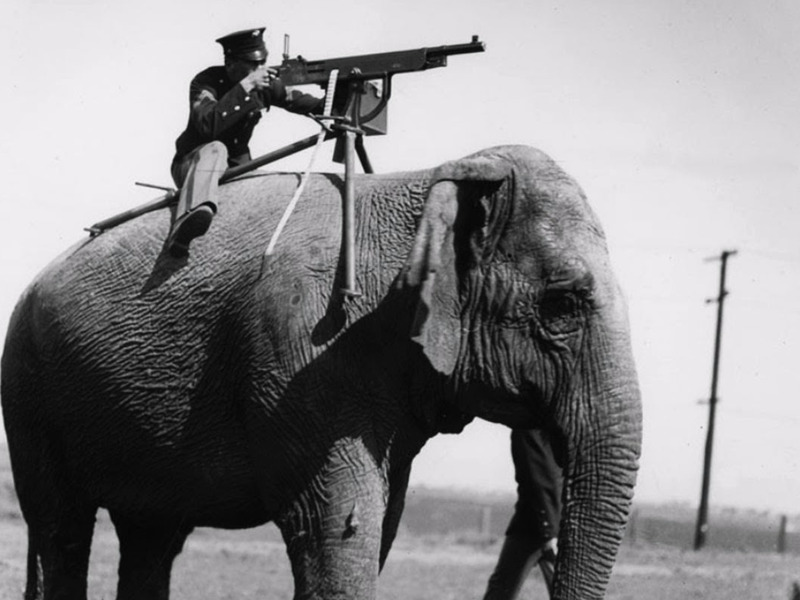 Off the battlefield, militaries still found ways to make use of elephants. As recently as 1987 Iraqi troops allegedly used elephants to transport heavy weaponry for use in Kirkuk. In 1960, the US Navy first began its studies on dolphins. At first, the studies were limited to testing how dolphins were so hydrodynamic, with efforts on applying the findings towards improving torpedo performance. However, by 1967 the US Navy Marine Mammal Program evolved into a major project. The program, which is still ongoing, began training dolphins for mine hunting and force protection missions. 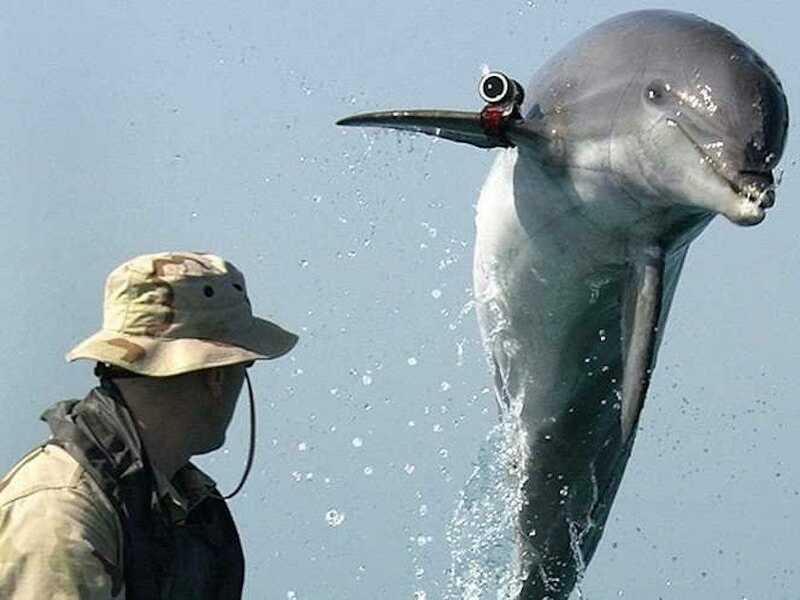 In the case of mine hunting, dolphins were trained to locate underwater mines and release buoys over their location, allowing the Navy to safely clear the weapons. During the Iraq War in 2003, such dolphin-led operations led to the clearance of over 100 mines in the port of Umm Qasr. Additionally, dolphins have been trained to guard harbors against enemy divers. When a diver approached, the dolphin was trained to bump a buoy device onto the person's back which drags them to the surface. 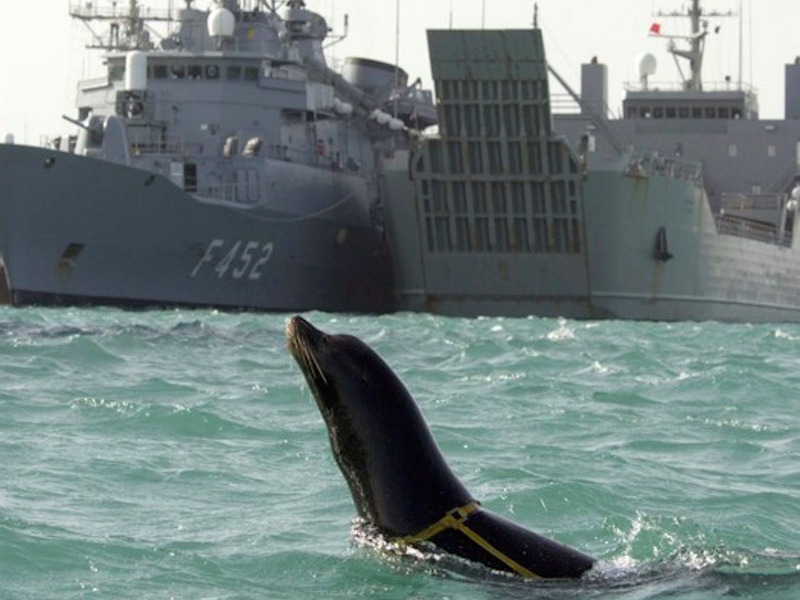 'These animals are released almost daily untethered into the open ocean, and since the program began, only a few animals have not returned,' according to the Navy. The Nazi betrayal of the Soviets during World War II caught the Russians completely off guard. 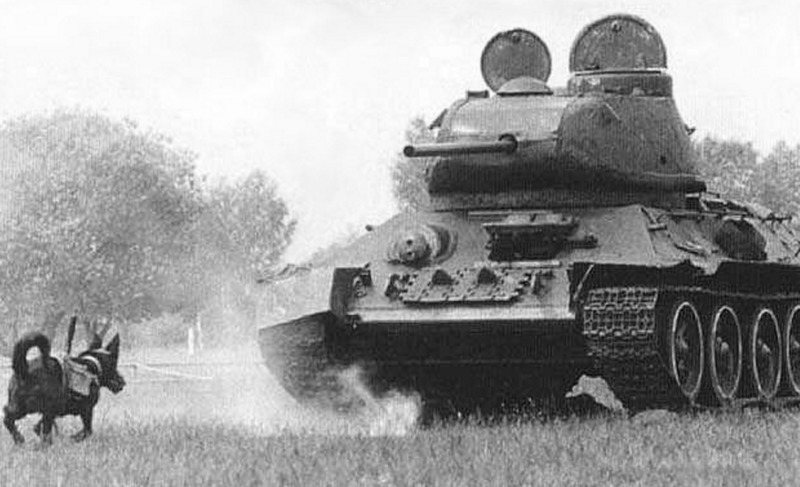 In a desperate attempt at staving off the Nazi advance into their territory, the Soviets originally attempted to train dogs to place bombs in front of tanks before running back to safety. When this proved too difficult a feat for training, the Soviets instead began strapping bombs to dogs that were activated by a small lever rising from an attached pouch on the dog's side. When the dog would dive under a tank, the lever would strike the tank's chassis and detonate. Soviet propaganda claims that around 300 German tanks were destroyed in this manner. However, the majority of the program proved to be a failure. The dogs were trained on Soviet diesel tanks, instead of German gasoline tanks, so during deployment the dogs had a habit of running towards Soviet vehicles based on scent. The anti-tank dog program continued until 1996. Pigs have been recorded in multiple ancient texts as one of the most effective counter-weapons to war elephants. War elephants were reportedly terrified of the squealing and charging of pigs, so both the Romans and Alexander the Great made use of them in campaigns against enemies that fielded elephants. 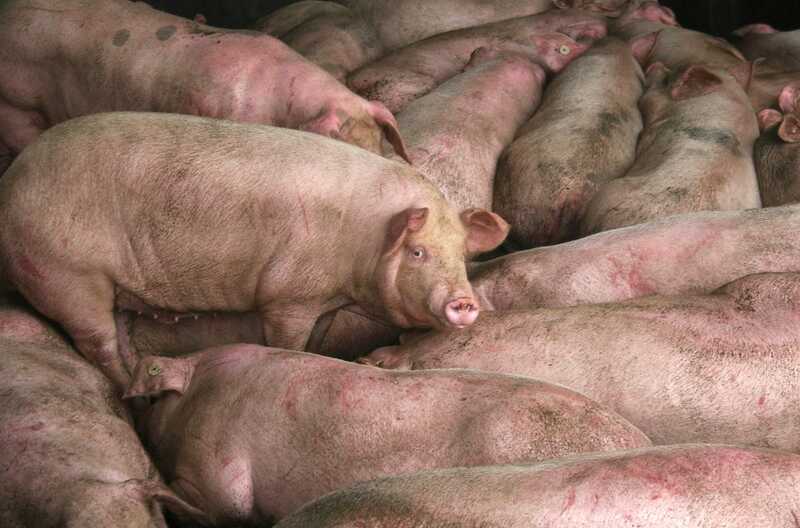 In one particularly brutal scenario, the use of incendiary pigs was also recorded. Eglan notes in Beasts of War that 'Antigonus II Gonata's siege of Megara in 266 BC was broken when the Megarians doused some pigs with a combustible pitch, crude oil or resin, set them alight, and drove them towards the enemy's massed war elephants. Developed by the US for use against Japan during World War II, the bat bomb was literally that. Each bomb would contain 26 trays that each held 40 hibernating bats. Each bat was meant to be outfitted with an individual incendiary device that was set to detonate after a specified amount of time. The bombs could deploy their own parachutes, giving the bats time to fly out and look for places to roost. The US was planning on dropping hundreds of the bombs over Japan's industrial cities in Osaka Bay. As Japanese cities at the times were largely constructed of wood and paper at the time, the bombs would have caused thousands of fires and burned large sections of Japanese cities to the ground. The project was ultimately superseded by the atomic bomb. The US Navy Marine Mammal Program, in addition to studying and deploying dolphins, also employed California Sea Lions. Trained in the same facilities, and even sometimes working on the same missions together, the sea lions helped to protect US harbor installations and ships against enemy divers as well as retrieving text equipment that is fired from ships or dropped from planes. The sea lions are naturally excellent divers, outperforming even experienced human divers at a fraction of the price. The Navy first used sea lions to recover a test anti-submarine rocket from a depth of 180 feet in November 1970. 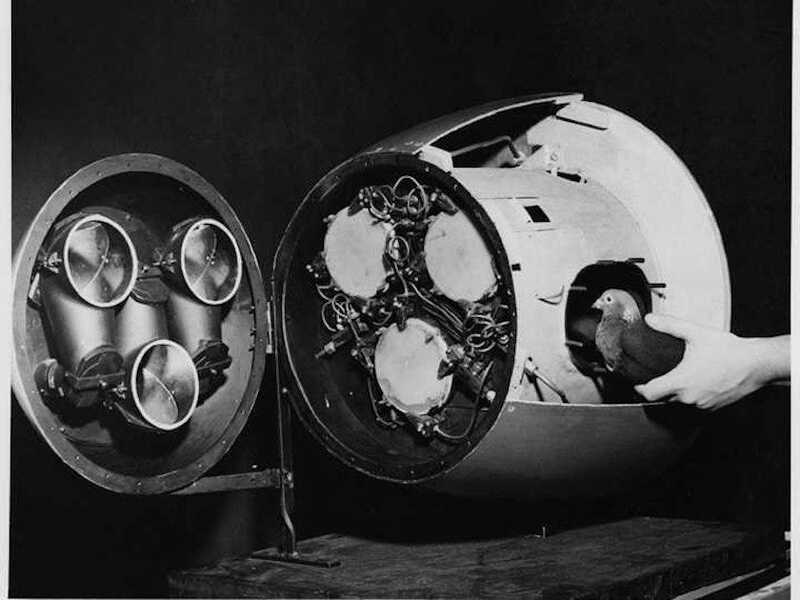 Pigeon-guided missiles were developed by noted behaviorist B.F. Skinner during Project Pigeon. Although the project was ultimately canceled because of the impracticality of the weapons, the idea of pigeon-guided missiles showed promise. Although the project was canceled in 1944, it was revived in 1948 by the US Navy. However, after missile guidance systems were proven effective in 1953, the idea of pigeon-guided missiles was finally laid to rest. After being released from a Siberian labour camp during the Nazi invasion of Russia in 1942, the 22nd Polish Supply Brigade began a long trek south toward Persia. It was then that they encountered Wojtek. 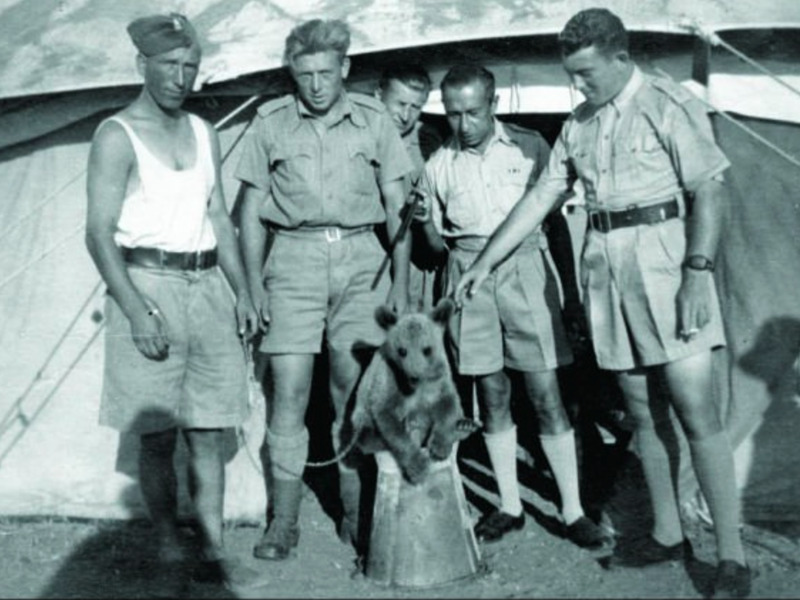 After a long journey, Wojtek's company finally reached Egypt where they prepared to re-enter the war zone through Italy. The army had strict rules denying pets passage to war zones, so the company did the only thing they could -- they made Wojtek an official soldier. The acoustic kitty was a CIA project in the 1960s that set out to use cats to spy on the Kremlin and other Soviet embassies. In theory, a cat had microphones implanted in their ear canals, and radio transmitters in the base of their skulls. In theory, the cats would become mobile, albeit unpredictable little spies reporting immediately back to the CIA. 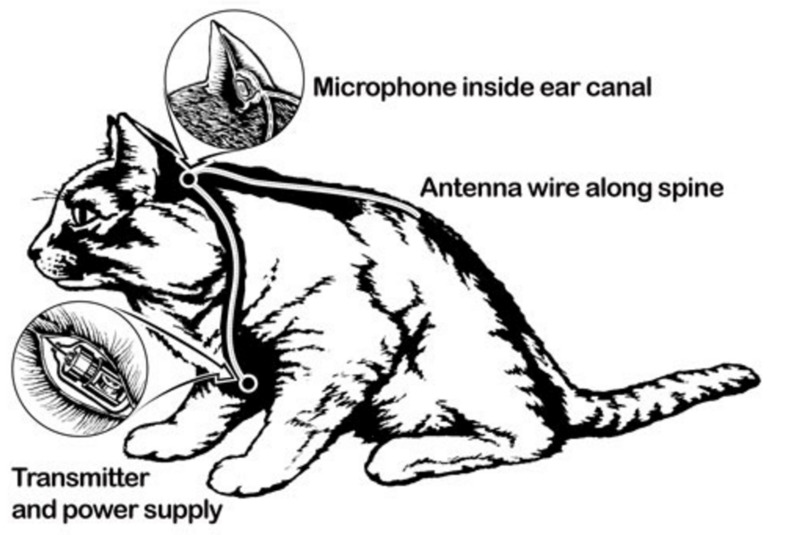 In the first deployment of an Acoustic Kitty, the cat was unleashed around a Soviet compound in Washington, D.C. The cat was released nearby, but a taxi struck and killed the cat almost immediately. Predictably, the CIA abandoned the project due to the difficulty of getting a cat to do pretty much anything on command. The project reportedly cost $20 million.